The summer heat is upon us! I don't know about you, but I hate to be hot and uncomfortable. Luckily for us, summer fashion can be so easy! My favorite way to beat the summer heat while still looking chic is to simply throw on a dress or a skirt. Yesterday after work, I did just that. I love J.Crew Factory's "Linen Cotton Mini" skirts! I wish I had snagged more colors before they sold out. I am due for a Factory trip, so maybe I can find some in store! The skirt is extremely versatile and can be paired with many different tops for a variety of looks. This time I went for extreme comfort and threw on a simple Old Navy tank top. I swear by these Old Navy tank tops! Cheap, comfortable, great alone or layered, there is no reason to spend more money elsewhere. I am pretty sure I have collected every color over the past few years. By the way, how cute is this Sira Mara necklace I am wearing? I love how bright and colorful it is. Perfect for summer! Of course, no outfit of mine is complete without a Gigglosophy bracelet! 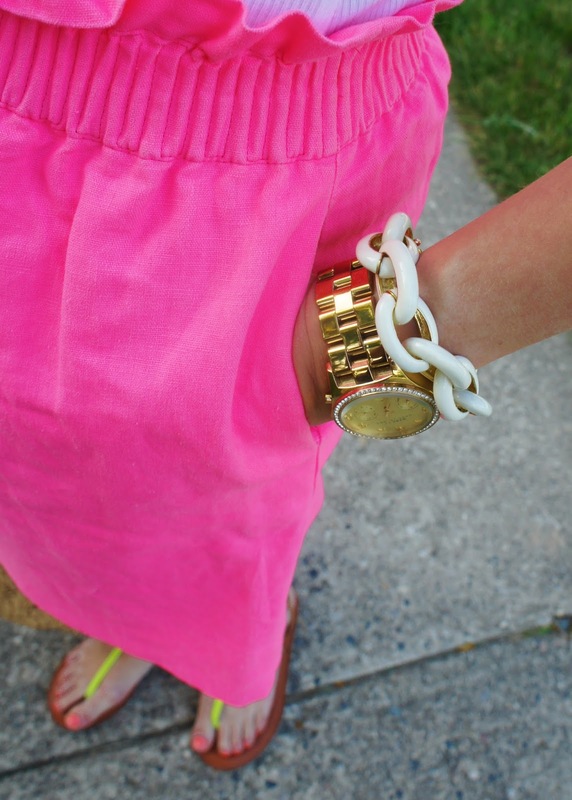 I added a second pop of neon with my sandals, complimenting the bright colors in the necklace. I was also excited to break out my favorite straw tote again for the summer! Did you notice my Anthropologie sunnies arrived early?! They actually arrived yesterday, and I am in love with them! I could not wait to wear them, so I threw them on with this outfit after work. They were definitely worth the wait! If you are on Instagram, I'm sure you noticed a few of us got them! Such a great Karen Walker look for less! Photos by my loving husband. He's a good sport!